The Five Actions of Gratitude is a system, not simply a list of activities. The fifth action, Create Goodness, is the linchpin of the five. The first four – Say Thanks, Give Back, Make Welcome, and Honor Others – can each stand on their own as a reasonable strategy for acting to better organizations and communities. It is hard to deny the importance of gratitude, service, hospitality and recognition for contribution? Yet, each functions best when the social and organizational environment is receptive to them. The old Industrial model of business presumed that each person was a cog in a grand machine of industry and commerce. As I described in an earlier column, this created a disconnect between people and their work together. Relationships were messy and people’s innovative ideas slowed down the system. It was a system built upon experts at the top of the structure directing the functionaries below. The greatest detriment of the old model, though, was the loss of each person’s potential contribution. The system was built for efficiency of activity, not optimization of potential. As a system of leadership and organization, it was not sustainable and, today, is contributing to the decline of modern industrial capitalism. 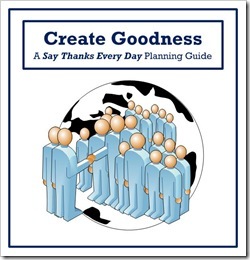 The Five Actions of Gratitude are a set of modest ideas that are subversive of this old model. This is most apparent in the action of Creating Goodness. To Create Goodness is based upon a simple understanding of human nature. First, our humanness is discovered in action, through personal initiative. Innovation and discovery are the fruits of human initiative in seeking to understand the world, and find better ways to live and work in it. Individual initiative is at the heart of the entrepreneurial impulse. Initiative begins a process of discovery, creativity and leadership. It is a core function of our humanity. In creating goodness, we lead in the many and varied contexts of our lives. We initiative with ideas as we communicate. Initiative happens in relationships as create collaborative partnerships. And it happens in the mundane activities of work, as we make decisions and act upon ideas. Second, there is unique purpose to every person’s life, expressed in action, in the work that we do. This is part of the reason why the old Industrial model was unsustainable. It denied the inherent purposefulness of each human life. The result is a loss of much of the potential that resides in every organization and business. The ancient Greek Philosopher Aristotle taught his students that “every action and pursuit is considered to aim at some good….what is the highest of all practical goods? … It is happiness, say both ordinary and cultured people; and they identify happiness with living well or doing well.” By this he means that the actions born from our individual initiative, through our relationships, in our work and the daily course of our lives aim at goodness, defined as happiness or living or doing well in life and work. This is part of what was missing, and what The Five Actions of Gratitude seeks to restore. Third, we live and work within communities of relationships that provide us a context for understanding who we are, what our talents are, and how our initiative can make a difference. Each of us is born with a creative impulse to contribute, to share, and, yes, to co-create with friends and colleagues. Our creative activity is always done in a social context of relationships. I’ve written elsewhere – here and here – about the importance of the local as a way to understand the nature of our interactions whether face-to-face or globally connected.. When we create, we interact with ideas, emotions, objects and social contexts. We bring these together to “create” a connection with ideas, in relationships and through the social and organizational setting where we live and work. Even the most cynical, nihilistic artist wants to create a connection between his art and its message. The art that comes from individual initiative, therefore, is personal, but not private in a hermetically sealed way. When an organization structures its social life around creativity, it is saying to its employees that their contribution is not just measured, but valued. The purpose of developing organizations of Open Hospitality is to create an environment where people can release their creative potential in contributions of initiative and action that matter. In so doing, their initiative is not done in isolation from other initiators, but rather in collaboration with them. For the freedom to create in an organizational context should have as few barriers to initiative as possible, and as many opportunities to contribute as possible. As we see in the Aristotle quote above, the purpose of our lives and work is to create goodness. Contemporary philosopher Alasdair MacIntyre in describing Aristotle’s thought on this point wrote, “ What then does the good for… (humanity) … turn out to be? … It is the state of being well and doing well in being well … . “ The word that Aristotle uses is eudaimonia (eu-day-mo-knee-a), traditionally translated as goodness. Its meaning is much more complex that simply as an adjective for describing a piece of pie or last Sunday’s football game. It touches on ideas related to fulfillment, human flourishing, happiness and completeness. The good person is one whose whole life is an integrated combination of thought, feeling, initiative, interaction, and action, resulting a good life or good work, or a better product, community or world. Each person lives within specific social and organizational settings where their potential is realized in being persons who create goodness. Imagine with me again what this might mean if a whole organization was organized to create the conditions where each person within the company could live a good life? What we would see, I am convinced, are the other Four Actions of Gratitude lived out, not as special or occasional random acts of kindness or gratitude, but as the way we live and work together. Tagged with action, Alasdair, Aristotle, collaboration, context, create, create goodness, creativity, eudaimonia, give-back, goodness, honor others, hospitality, human, industrial, initiative, leadership, life, MacIntyre, Make Welcome, model, Openness, organization, purpose, Say Thanks, social, subversive, work.